In the previous chapters, we have archetypally associated the process of OUTformation/Creation (the study of which is Ontology) with the Female gender, and the process of INformation (the study of which is Epistemology) with the Male gender. In ancient times, these processes and functionaries were often represented anthropomorphically. 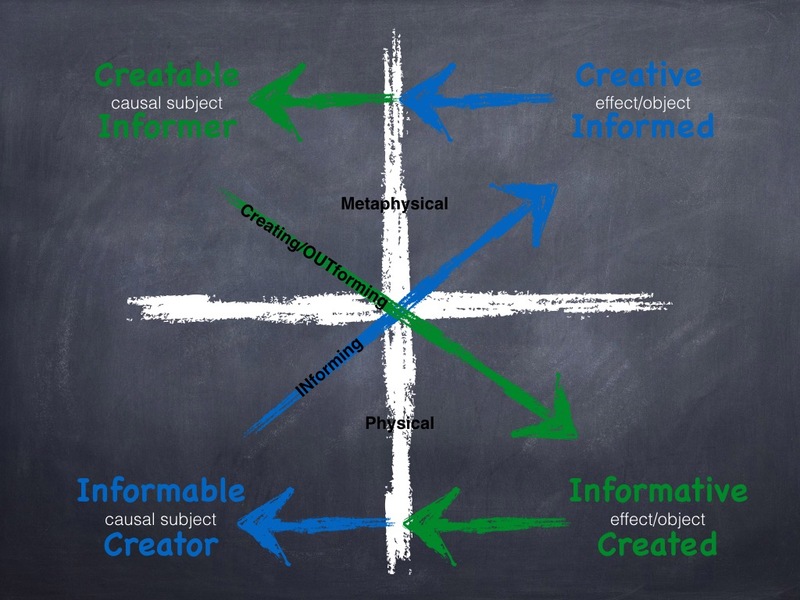 Our now familiar four quadrants interact across two realms. Below is a reprint of the color-coded original Quadernity Model with labels. Shortly after recognizing that the two sets of three arrows connect the dual realms in the fashion of a figure 8 infinity loop, a new morning vision displayed a pair of inverted triangles. With their apexes touching at the central intersection of the quadrants, the triangles lit up, one after the other, in quick succession. For an animated representation, click the white arrowhead in the middle of the screen to activate video. There is no cause without an effect, and no effect without a cause. And paraphrasing Isaac Newton’s Third Law, there is no action without an equal and opposite reaction. The OUTforming of Earth and the INforming of Heaven are inextricably linked. In eastern traditions, our actions are “karmic”. The statement, “What goes around, comes around” reflects the nature of karma. We recognize the power of our actions, thoughts and emanated frequencies, for we cannot take back their repercussions any more than a projectile can be retrieved mid-air by the one who aimed and launched it. In the case of our two sets of Quadrants (those of Creation/OUTformation and those of INformation), it is also true that what goes around comes around. The process of OUTformation is in feedback with the process of INformation. Now is a good time to read the linked aside on Standard Feedback. Before sleep that night, I wondered if this is what was meant by the alternating triangles. With the next day’s vision, the intersection flashed brightly, and then the two triangles appeared simultaneously. The visions always moved on to new messages when I correctly grasped their meaning. To be open to the message was to trust in their unerring flow; however, this vision seemed to contradict the previous intuition. I was taken aback; why would the dreams show me something one way, only to quickly reverse the impression it gave? This was not simply a matter of clarification or refinement; instead, it seemed to be a complete change of meaning. I asked, “What have I misunderstood?” In response to this question, the chalkboard displayed, side-by-side, both the alternating triangles and the co-emergent triangles. This chapter is about the lessons learned from that question. As we learned in the Quadrants of Information, the Male’s act of Observing makes the Female’s OUTput particular. The quote below reflects how the Informable Creator (LLQ), through His selective Observation, makes the not-yet-manifest (Creatable, ULQ) become manifest. What meaningfully ‘matters‘ to the Observer (LLQ) INforms the Collective Consciousness, in the heavenly domain (URQ) and seeds what physically ‘matters‘ (OUTforms) occurs on the earthly domain (LRQ). What meaningfully ‘matters‘ to the Observer constrains His receptivity, and thereby, His actual prehension of non-linear probabilities availed by the Female/Mother. What physically ‘matters’ is that which the Observer selects precognitively and afterwards re-cognizes. We see below from the Online Etymology Dictionary that to matter is to be of importance or consequences. If to matter (verb) is to be of importance, then importance (noun) is inherent in the process of becoming matter. We could say that the Observer ‘imports’ what He presumes meaningful/important before He reflects on it as an Object in the spatial domain. From the inset below, we note that import/importance are connected etymologically with both phrases, ‘to matter‘ and ‘to have meaning‘. That which is imported, or brought in from another state or land (or, as Quadernity shows, from another dimension/domain), signifies meaningfulness. We have heard the statement that “beauty is in the eye of the beholder”. Similarly, importance must be in they eye of the Observer, whose act of Observing is necessary for something to matter/manifest/OUTform. What matters to someone matters for them. After having been Observed/singled-out/decohered from its super-position, the Informative Object is re-viewed by its maker, the Informable Subject, who had de-stilled it from its homogeneous solution, the ground state. Upon revision, the Informative has become Created (LRQ) and the Informable has become Creator (LLQ). The ‘now’ is an existential opening, the doorway through which the unmanifest becomes manifest (both as subject and object, as mind and matter). This ‘now’, as an instantiation of Quadernity, is depicted below as the act of Observing, involved in both Outformation and Information. In both graphics, Observing is situated between the before of potentialities (white triangles) and the after of actualities (colored triangles). Observing is a two-way trans-action, during which invisible potentials cross at the center and vanish as their explicate actualities appear to simultaneously populate the dual domains: Created Earth (LRQ) and INformed Heaven (URQ). Each explicate actuality immediately becomes an implicate potentiality, which then moves in the opposite direction. Look again at the arrows in the graphics above to see that the Created/OUTformed becomes INformative and the INformed becomes Creative. These pairs of labels occupy the same quadrants, LRQ and URQ, respectively. Proposing that OUTformation and INformation can both neutralize and reinforce each other brings us another paradox. A solution is offered in the aside: Positive and Negative Feedback. My dreams revealed inverted triangles appearing both in alternation and emerging simultaneously from a central flashing star. Instead of thinking the lessons were contradictory, we considered the possibility that both ways of seeing the processes were true in different contexts. If we consider the feedback between the Female and Male Subjects, we see that they alternate their actions so that the OUTput from one is received as INput by the other. In their feedback, every inhalation is countered by an exhalation. For every Pull there is a Push; for every explicate reality there is an implicate potentiality. This was symbolized by the alternating flashes of triangles. On the other hand, if we consider the system as a whole, every fluctuation is simultaneously balanced by a counter-effect. The whole stands alone and unchanging, unaffected by the alternating oscillations of the Female and Male. Therefore, the net effect of the couple’s breathing is “windless“. This was symbolized by the simultaneous flashes of inverted triangles. The Male and Female, unified into a coherent whole, breathe. Each gives to, and receives from, the other, in pulses of Self-sustaining Life. The synchronous blinking on and off of inverted triangles, as seen in my second dream, indicated that the appearance of actualities are punctuated by fleeting potentialities. As we now know, potentialities are actualized by being observed; what is not so well known is that constant or quickly repetitive observations make actualities seem to persist over time. For this reason, we do not notice physical matter blinking on and off (although, virtual particles do). The counter-intuitive orchestrations of inverted triangles, as seen in my visions, finally made sense! You can only imagine how I felt, years later, when I discovered the following quote. [D]iachronically, the field domain is prior: it is the generative ground [ULQ] of the particles and societies of particles that populate the spacetime domain [LRQ]. Synchronically the generated entities are linked with their generative ground through an ongoing bidirectional interaction. Not mentioned in Lazlo’s quote is the INformable Creator/Observer (LLQ), whose subjective act both INforms heaven/”cosmic plenum” (ULQ) and OUTforms earth/spacetime domain (LRQ). 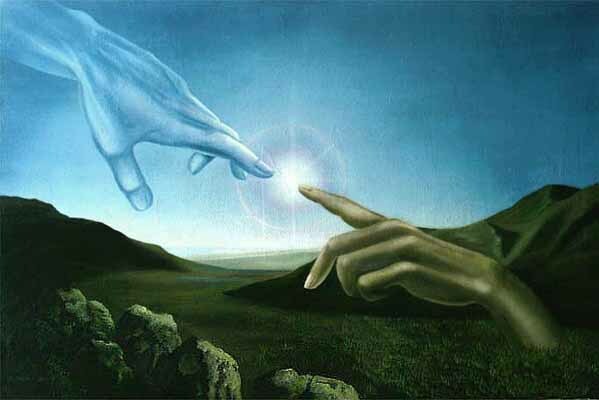 In the beginning, God [Observer/Creator] created [populated the domains known as] heaven and earth [with Patterns/fields of INformation and Matter/particular OUTformations]. A lesson I learned from these seemingly contrary visions is the importance of recognizing different levels in our communications, whether we are discussing things in relationship or the complex as a whole. Ideas and statements can be true on one level and false on the other. Idioms that may be pragmatic on one level may be ridiculous on another level. To facilitate effective communication with others, it is helpful to verify that all concerned agree to which level is in discussion. Besides the two-by-two chalkboard grid model we have explored so far, additional models began presenting themselves in my morning dreams. These models, introduced in the following unit, More Models Evolve, provide new perspectives on the same dynamics of Quadernity. Sometimes, depending on the issue we are exploring, one model may be more useful than another. It is like having different kinds of maps available. Although they all represent the same territory, one may be better for finding the best route to a chosen destination, a different one may be better for understanding the terrain. Others may provide data about populations, natural crops, industries, or politics. You get the idea. Our horizon is broadening and we are ready!